"Burlington, Vermont’s largest city at just over 42,000 residents, comes alive in summer. The deep aquamarine Lake Champlain thaws and Waterfront Park, built on industrial land reclaimed in the 1980s during Senator Bernie Sanders’s tenure as the city’s mayor (he announced his bid for the Democratic presidential nomination there in May), teems with students and families. Kayaks and skiffs dot the water’s glassy surface while runners and bikers fill shoreline paths. Abundant recreational opportunities along with the city’s high walkability factor — you can stroll from the postcard-pretty downtown to the burgeoning arts scene in the South End — mean foodie tourists can burn off calories as quickly as they pack them on. (It’s a nice thought, at least.)" My wife and I have enjoyed wonderful meals at Hen of the Wood, A Single Pebble, Henry's Diner, Leunig's Bistro & Café; and others, of course. We regularly explore and shop at the Church Street Marketplace; and, we've explored the ECHO Lake Aquarium and Science Center. We've also been treated to a weekend 'in town' at the Hotel Vermont. Morrisville isn't known for having a proliferation of galleries or farm-to-table restaurants, but when Rogue Artisans Café soft-opens inside the Rogue Artisans woodshop and gallery this week, the cuisine will be as handmade and artisanal as the tables, chairs and décor. "We're an art gallery/café," says owner Jonathan Mogor, a Navy veteran who moved to Vermont three years ago. "Our whole focus is on keeping it local as much as possible." The café — which will be open seven days a week — will offer daylong espresso service (iced lattes! ), with coffee from Waterbury's Vermont Artisan Coffee & tea, alongside morning breakfasts and baked treats from pastry chef Donna Steffen. Her cookies, cupcakes and truffles also will be available into the evening. On the savory side, chef Jason Gelineau (formerly of Johnson's French Press Café and the Stowehof Inn & resort) will layer house-roasted-and-brined meats into panini. One specialty, Spalted Maple, will stuff turkey, bacon, cheddar and apple between slices of Klinger's Bread French toast. Other stackers include the Burn Pile, featuring house-pulled pork and coleslaw served on polenta bread from Hardwick's Patchwork Farm & Bakery, and a handful of creative vegetarian options, salads and soups. The pair's waffle is at once savory and just a bit sweet, crisp outside and pillowy within, whether served in a dinner or dessert context. In the past couple of years, practically every contemporary American restaurant to open in Vermont has debuted with chicken and waffles on the menu, and Phoenix Table is no exception. Read the complete review in Seven Days. 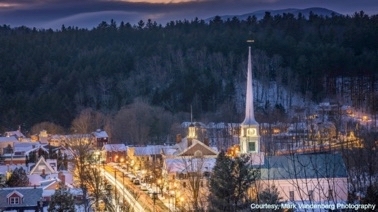 In one way or another, restaurants in Stowe often are descended from the town's resorts. Chefs move downtown from the mountains, and former hotel managers try out their own independent dining concepts, all bringing a bit of the slick sheen of big business with them. Plate, which opened on Stowe's Main Street on March 12, is an anomaly. The small dinner spot is actually descended from an even smaller restaurant called Jamie's on Main. Jamie Persky and husband Mark Rosman sold their breakfast-and-lunch destination in 2011. Now they're back with a new restaurant, right across the street, bringing a breath of fresh California air. Read the complete article in Seven Days. Coldwell Banker Carlson Real Estate will be moving next door to Plate in early July. A week or so ago, I was poking around in our new space, and ran into Jamie and Mark. I'd been looking forward to meeting them, because, I'd been told, they're both from Los Angeles, as am I. We had a nice chat in an unfinished hall and discovered several similarities and coincidences about our previous lives in L.A.. I'm looking forward to exploring those when we become neighbors in just a few weeks. If you haven't yet been, get yourself in there for a bite to eat; and, perhaps a drink with Mark at the bar. For Jack Pickett, his new restaurant on Stowe's Mountain Road has been a long time coming. "The plumber finished last week," said the restaurateur best known for the now-closed Frida's Taqueria and Grill. "He cut his first pipe two years ago." On April 26th, Phoenix Table & Bar, Pickett's collaboration with Frida's co-owner and chef Joshua Bard, finally opened after two and a half years of work. The first night was a benefit for the Morrisville Food Co-op, a project in which Pickett has been instrumental. Phoenix's full menu debuted with a normal dinner service on Sunday, April 27. Stowe’s après-ski scene will regain a familiar face next month when new owners reopen the well-loved Rusty Nail at 1190 Mountain Road. A trio of partners purchased the 45-year-old venue earlier this month for $1.2 million and plan to have it up and running by Presidents’ Day weekend under the same name. “This has been here since 1969, and we’re going to let that history ride,” says Dave O’Connor, who will comanage the space with Dave O’Rourke. Both Daves are currently bartenders at Crop Bistro & Brewery, the nearby restaurant co-owned by Bill Davis. Davis is the third partner who purchased the 9,500-square-foot Rusty Nail building on January 3. The most recent iteration of the Nail closed just about a year ago, but the building’s previous owner — Massachusetts urologist Stan Swierzewski — had it on the market long before that. In March 2012, the Rusty Nail was listed for $1.95 million. According to town records, the new owners paid $28,168 in delinquent taxes when they took ownership. After riding out the remainder of the ski season, O’Rourke says, he and his partners will complete “minor renovations” to the building in the spring. Perhaps the process has already begun: Earlier this week, an observer could see workers chucking a stream of crates and equipment out the back door and into a dumpster. With all the positive press garnered by the new Hotel Vermont since it opened in June, my wife and I went to the big city to see for ourselves. And, of course, we absolutely had to dine at the new, and 2nd location of Hen of the Wood (read the very recent Seven Days review), which is somehow associated with the hotel, despite it being next door without an interior connection. Well, I'm here to tell you we have found our new and best close-to-home getaway. The hotel was immaculate; our room couldn't have been better; and, the staff was attentive, polite, and efficient. 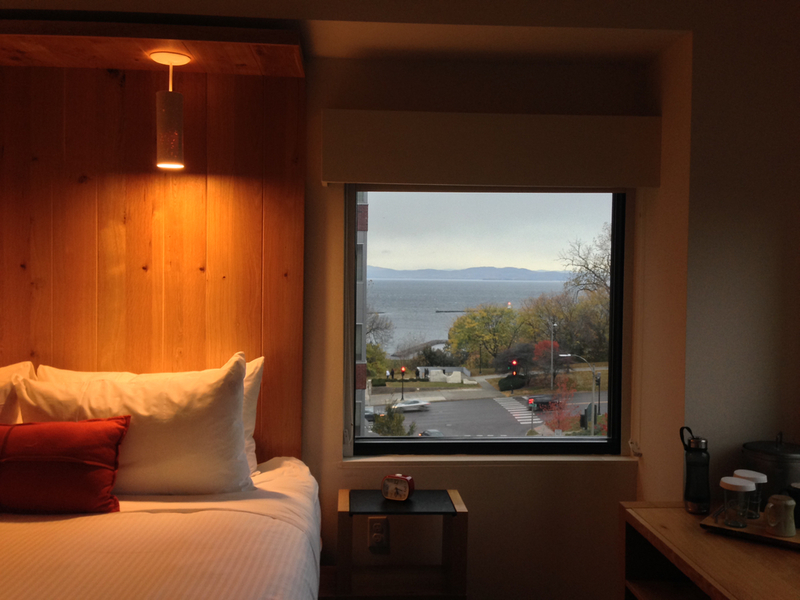 Going to Burlington for an afternoon to poke around before lunch or dinner is no longer just a day trip, but rather an opportunity for an exceptional 1-night vacation. And while we may not eat at Hen of the Wood every time, the Hotel Vermont will be our Burlington address. Hotel Vermont: It's So Vermonty! When a state governor stands in the lobby of a new hotel and pledges support to ensure it is "sold out every night," you know this is no ordinary establishment. Hotel Vermont (check rates at Kayak.com) is the state's first independent hotel to open in 40 years, and it's more than a hip place for Burlington visitors to rest their heads. Owned by entrepreneurial Vermonters and built with environmental sensitivity and a commitment to local producers of everything from furniture to flannel robes to food, Hotel Vermont is a vibrant showcase for all that makes Vermont singular among the nation's 50 states. At Hotel Vermont's June 25, 2013 grand opening, Governor Peter Shumlin also vowed to be at the first table when acclaimed Vermont Chef Eric Warnstedt opens his second Hen of the Wood farm-to-plate restaurant on the premises in late August 2013, an addition that will cement the hotel's status as the destination for an authentic Vermont experience. "Burlington’s Hen of the Wood was arguably the city’s most eagerly anticipated restaurant this year. HOTW’s first location, in a former Waterbury mill, carries a certain mystique; wildly atmospheric and challenging to diners seeking reservations, the place has long been popular for special-occasion dinners. Chef Eric Warnstedt, a multiple James Beard Foundation Award nominee, is behind its resolutely seasonal dishes." BY ALICE LEVITT ON APRIL 17, 2012 | SEVEN DAYS There's nothing like a lovely spring day to stir brunch cravings. I'm ready for a Benedict at any time of year, but when I headed to the Rusty Nail Bar & Grille on Sunday, I was met by a brunch rush that could only have been kindled by the 70-degree weather and plenty of outdoor seating. Chicken and w affles would just have to do. The crunchy waffle was cooked a minute or two longer than I would have preferred, but was still delicious. It was the first sourdough waffle I ever tried. The starter gave it a deep underlying tang at the end of each malty bite. Caramelized peaches seasoned with Chinese five-spice powder took the place of syrup as a sweetener, though I wish there had been even more of the irresistible fruit.